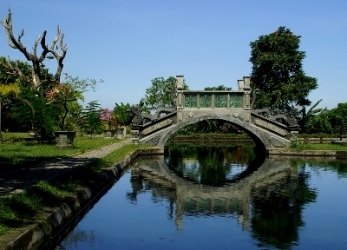 Tirta Gangga, located on the north side of Karangasem, about 15km northwest Amlapura along the main road toward Singaraja. The village is shadowed by Mount Agung and offering a majestic view of the mountain. It’s like the green ocean. The rice paddy fields around this area is the most beautiful sight of Bali. The area is pleasant with cool temperature, make it easier and comfortable to explore the surrounding and to enjoy the view. Spend more days in this area, you won’t be regret. The fertile land, the forest and hilly villages around Tirtagangga offer an endless choice of walks. The Water palace itself is very charming with Ornamental ponds ,cool and swimming pools. Surrounded by lovely gardens with stone carvings and statues. You can see that the architecture is blend of Chinese and Balinese style. It's designed by Anak Agung Anglurah, the last Raja of Karangasem as a resting place. This Raja has obsession with pools, moats and fountains. The place is very popular among the local people and also tourist are very welcome here. The pools are holy and they irrigate the rice paddy fields in the whole region. But you can even enjoy to swim in this water palace. There are two swimming pool open. The little one is shallow and the bigger one is clear and cool water. It’s very attempting to swim, especially in the early morning with the morning sun and mist. Can you imagine the picture??? Romantic isn’t it? It’s very peaceful place to visit, enjoy the walking with the scenic beauty and cool area. The palace was totally destroyed by the eruption of Mount Agung in 1963, and the place was abandoned. After some renovations, it becomes the most beautiful palace of Bali. To enter the complex, you have to pass a crowd of guides and food stalls. Take a look of this video to see how beautiful Tirta Gangga is. The video is taken by a friend Marlene Challis, she has also an lovely and friendly website about travel around the world. I like to read her site. If you would like to know more, click here.